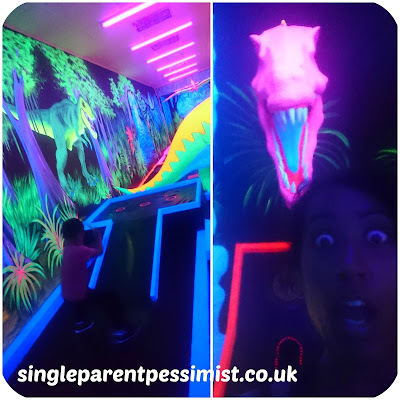 This week Chunk and I got to try out the brand new indoor ultraviolet mini golf course full of Chunk's favourite thing... dinosaurs! 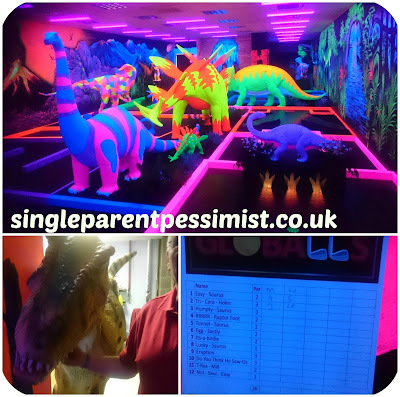 Jurassic Globalls is Brighton's first indoor crazy golf centre that involves playing in a darkened room full of ultraviolet light and fluorescent sculptures. The room even has sound effects and an aroma to give you the feel of being outside in a forest which adds to the experience and makes it 4D! It's safe to say Chunk loved it from the second he stepped into the room and saw all the dinosaurs. He'd never played crazy golf before but it didn't take long to show him how to tap the ball and explain the rules. For a four-year-old the boy had skills unlike his mother, even if at times he didn't quite get that he couldn't position the ball next to the hole whenever he got impatient. The 12-hole course had a good range of simple, medium and difficult holes meaning it could be fun for both children and adults to do. I can see a lot of teenagers and hen/stag parties enjoying themselves here as well as families. The final hole was the most difficult, where the aim was to hit the ball up a steep hill to get into the T-Rex's mouth. Chunk took a fair few shots at it but he did eventually get it in and got a nice surprise when it made the T-Rex roar. I am not ashamed to admit that I never managed to get it into his mouth as I'm clearly not a natural golfer- I did have fun trying though. Throughout the course you fill in your scores and at the end of it you pop the sheet into their form box which enters you into their regular prize draw to win £100 which is an added bonus! I loved the design of the place more than anything, as the life size statues were selfie-heaven for me and I spent a lot of time admiring the wall murals as the detail was out of this world. 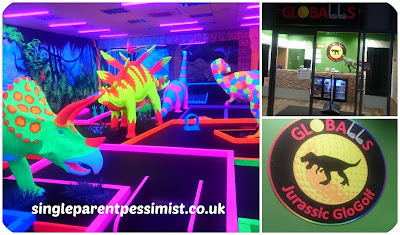 Jurassic Globalls launched last week and features life-size neon dinosaurs and some amazing vivid wall art which was created by local Brighton artists Sandy Moo and ZeeZee TwentyTwo. Globalsaurus (bottom left) Made An Appearance! 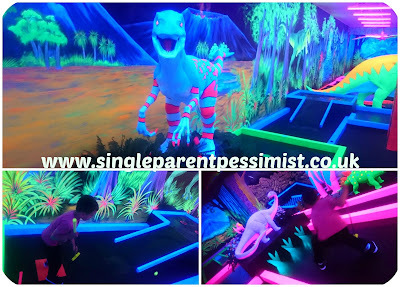 It was created and is run by a Brighton family and I'm impressed how quickly they did it; In a matter of weeks they built and decorated the mini golf course themselves, only hiring artists to complete the stunning wall murals. Grandparents Brendan and Sandra Cosgrove were on reception when we arrived and they explained how their son and daughter-in-law set it up after wanting to have an activity that families on a low budget could do, after spending years forking out tons of money each time they wanted to do something fun with their own children. It costs £5 per person and under 3s are free. This is a reasonable amount I think for this kind of activity, but I would love to see a discount for large families/ twins/ large groups because I know how expensive activities are when there's a lot of you! Brendan said the majority of his family, including himself, have building backgrounds so they were able to make the course and the dinosaurs from scratch. His brother creates film sets so created some of the prehistoric-style walls in reception and they look superb. The only thing the family bought rather than made was Globalsaurus. He is a gigantic, moving dinosaur that they use around Brighton Marina to greet people and advertise the course. Chunk and I would definitely recommend Jurassic Globalls especially when the weather's rubbish and your kids are itching to burn some energy, as unlike soft play areas you also get to have fun too! This looks like a fab day out!